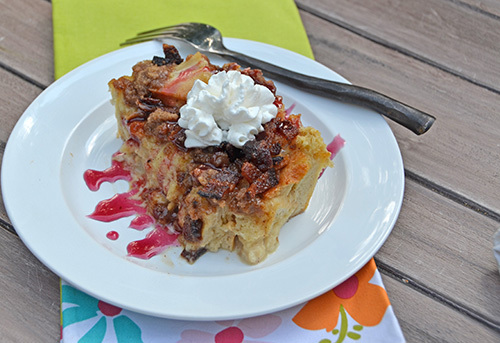 We served Candied Bacon French Toast Casserole with Mixed Berry Syrup at the Sunshine State Eggfest. This dish was Alexis' idea, and it was a huge hit. 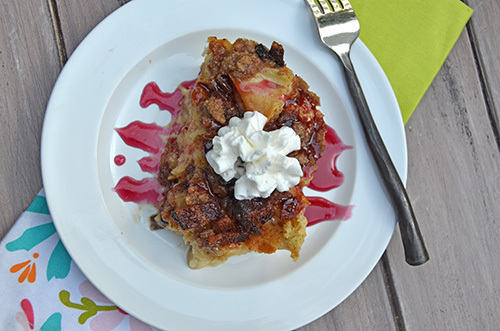 There is a lot of sweet in this dish, with the homemade syrup and whipped topping but the candied bacon has just enough saltiness to balance out the sweet. With 4,700 people attending, our sample sizes were a wee bit smaller. 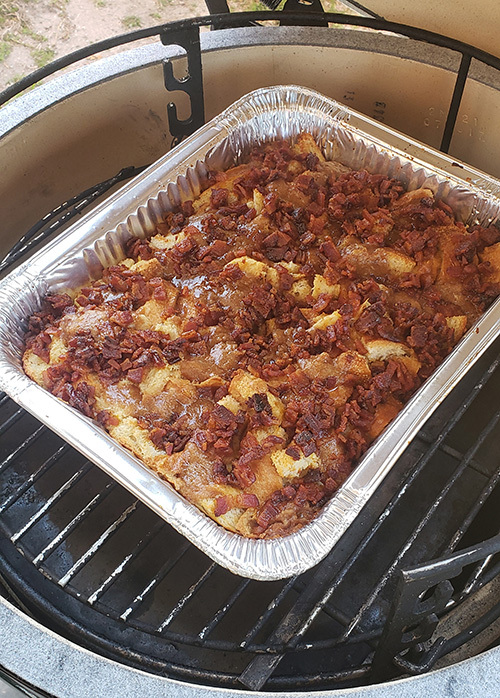 This dish is suitable for serving at an Eggfest because about 90% of is can be made ahead of time. That also makes it great to serve the family on a weekend morning. 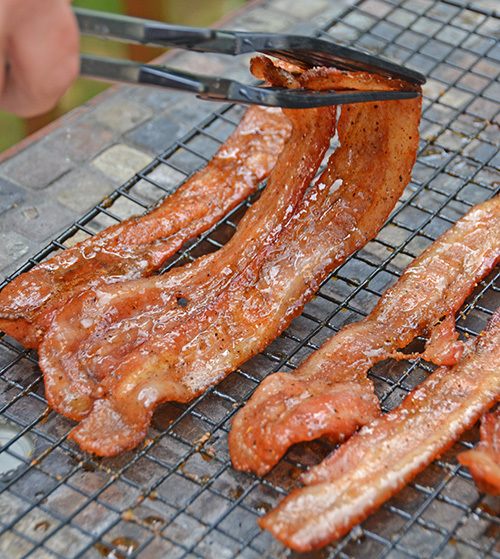 Make the candied bacon. Preheat grill set up for indirect heat or an oven to 350°f. Mix together the sugar, BBQ seasoning, and cayenne and coat the raw bacon with this mix. Place the bacon on racks in the grill/oven and cook until golden brown (about 20 minutes). Remove from the cooker, immediately take the bacon off the rack and allow to cool. Crumble once hardened. Make the mixed berry syrup. Place the sugar, water, and berries in a small pot over medium heat. Reduce heat once simmering and simmer for 15 minutes. Carefully strain through a fine sieve or cheesecloth and allow to cool. Keep refrigerated until use and heat slightly before use. Make the topping. 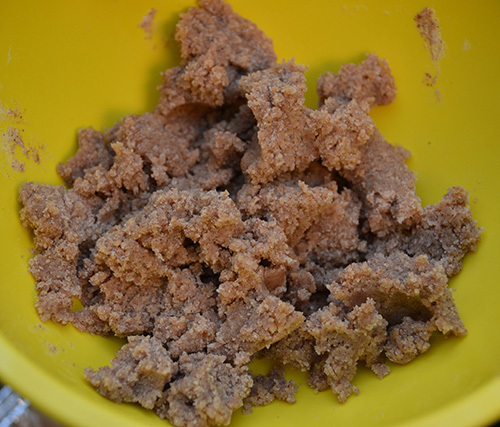 Mix together ingredients in a bowl, until combined and crumbly. Assemble the casserole. Place the bread in a greased half-size steam pan or casserole dish. Mix together the eggs, milk, half and half, vanilla and cinnamon. Pour this mix evenly over the bread. Sprinkle the crumbled topping and candied bacon bits on top. Cover with foil. Place in the refrigerator overnight. Preheat grill set up for indirect heat or oven to 350°f. Place the covered casserole into the grill/oven and cook for 20 minutes. Remove cover and cook until golden brown and cooked through, about another 20 minutes. Test by inserting a toothpick in the center and seeing if it comes out cleanly. 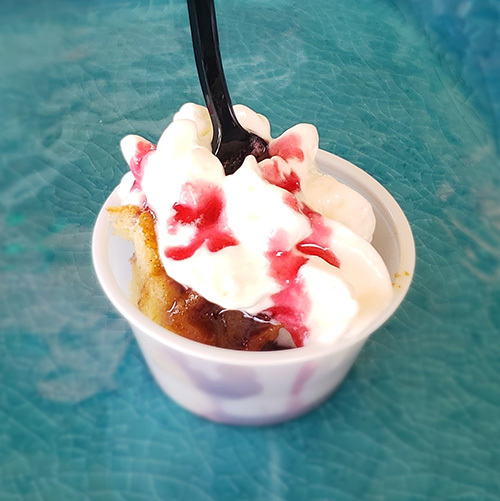 Cut and serve topped with the mixed berry syrup and top it off with whipped cream. Pro-tip: The mixed berry syrup also rocks on things like ice cream. I like to use either "cherry berry" berry mix or a blend of blackberry, blueberry, raspberry, strawberry to make the syrup. Use an indirect set-up for your grill. 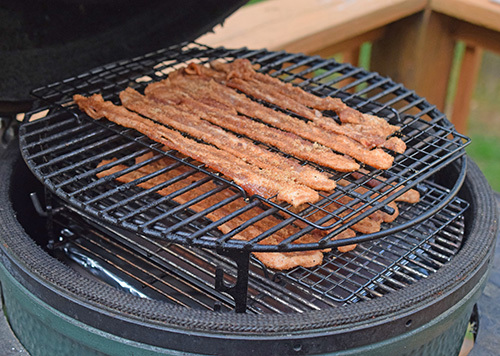 I was using a Big Green Egg, so I used an oblong heat deflector and an adjustable rig. If doing this in the oven, we use a half sheet pan and cooling racks so the bacon won't drip in the oven. Go by the color of the bacon. It will seem limp and not fully cooked when it comes off, but within 5 minutes, it will harden as it cools. Err on the side of underdone since this will cook longer on the casserole. This is what your topping should look like when mixed. Then you will just break it up over the casserole. You can tell this was at the Eggfest because of that pristine gasket. 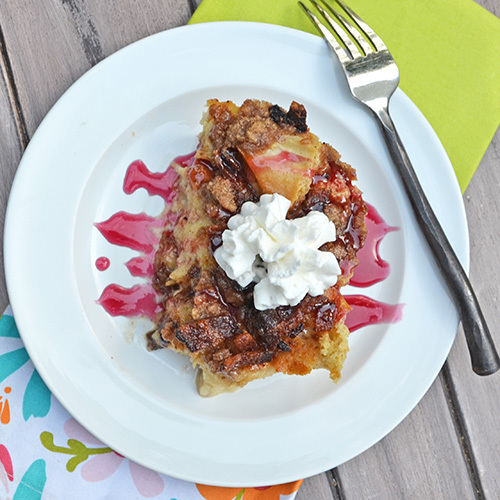 This is good for breakfast or dessert!